OK… It’s a Sunday morning, and I am lying in the bed. Maria has headed off to the kitchen to make coffee and toast. I am sorta dozing a bit, then in flies ML, all excited. In her hand, she is holding a cloth and it appears to be moving without assistance. In fact it is wiggling! Maria makes me nervous. She is a country girl and loves any living thing. While I have known many people who loved “any living thing”, almost all of them drew the line at things that had more than four legs. Many drew the line at two… but I digress. She flops down on the bed to unwrap my surprise. “Rolando!” “Se llama Rolando!”. 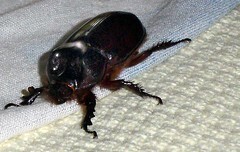 She has found a bug… technically a scarab (I think), she has named it Rolando, and it is now heading in my direction. “Does it bite?” sez I. “No, sez she, but it has claws and it can hold tight!”. “Swell”, thinks I as Roland approaches, (and I am running out of bed as I retreat). Those of you who have read this blog with any regularity know that while I am not exactly afraid of bugs… OK… I am a little afraid of bugs but not a lot… I DO have bug boundaries, though for sure I never knew I would need a bug boundary in my bed. It turns out I do. Ever since the famous flying cockroach affair, ML has has taken delight in tormenting me with tales of the plethora of creepy crawly things common to Costa Rica. “Get the camera!” sez she! You don’t have to ask ME twice! In fact I am thinking of the early hollywood movies where the actor sez, “Come on feet, don’t fail me now!” I head to my office to get the camera all the time wondering “If I just keep going, would that cause a rift in our relationship?” I decide it would, so I return with the camera. Rolando is now apparently 1. Happy and 2. Active. I find that it is very hard to photograph a moving bug, especially when the bug is moving towards ME and looks REALLY big in the viewfinder. I snap off maybe 217 photos in hopes of one decent one. Sort of bracketing to the extreme! Maria is ecstatic! She has her photos and can now takes Rolando to the garden where he can busily find other bugs of his specie and make another zillion little Rolandos. On the way to the garden, she cheerfully explains that in her home town near the Caribbean coast, these bugs grow to at least 3-5 times larger in size. I am thrilled. I also wonder how she knew to name it Rolando and not… ummm maybe… Betty. Naw. I don’t wanna know. Subscribe to comments with RSS or TrackBack to ' Meet Rolando! '. One of the reasons I am coming to CR is to see the bugs and things. I can’t get enough of them on TV. My neighbour once called me to remove a harmless, 1″ long grasshopper from her door. She would not go near the lock until I had got rid of it. She wanted it dead, I put it out in the grass…. Your website is really great, and your bug stories have had me laughing out loud! You have accomplished your goal of helping me decide about heading your way…and I’m not coming! My wife-unit would NOT survive a bug-encounter such as seems to be rather common. Much as I would like to come for 6-12 months (for myself) I know Linda wouldn’t get past the bug issues…not even close. Thanks for your efforts which will not discourage us from being touristas at least. You’ve done a great job, many thanks!